The Cannelloni from Abruzzo bring back the fondest memories of families, when grandmothers and mothers used to make the delicate dough sheets by hand, wrap them filling them with handmade condiments, making them special every Sunday. Originally from the province of Teramo, Cannelloni are still nowadays used in the other provinces of Abruzzo. Cannelloni were invented in the poor Bourbon cuisine of the 19th century in Civitella del Tronto, a small village in the province of Teramo and served for the French officers with the name of ‘Scrippelle’, antagonists of the famous ‘Rivotiche’, made with only water and flour, filled with the so-called “remains” (vegetables, meats and herbs) and in some cases covered with a big amount of Pecorino cheese of Abruzzo. 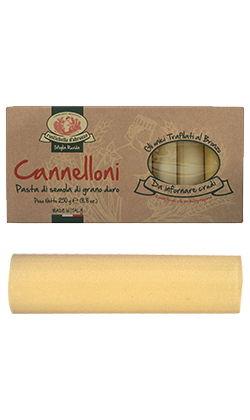 Rustichella d’Abruzzo brings to your table the traditional Cannelloni from Abruzzo. Made with a durum wheat semolina sheet, bronze drawn and slowly dried at low temperature, Cannelloni need to just be seasoned and put in the oven raw for 40 minutes. We recommend the following fillings: fresh ricotta cheese, stir-fried vegetables, a bit of Pecorino cheese of Abruzzo and a bit of Rustichella INTOSSO Extra Virgin Olive Oil, or with a ragu of Rustichella Pomodoro a Pera d’Abruzzo and meat or liver sausage of Abruzzo. Cooking time: 40 minutes.